If you close your eyes and count to ten, breath in twice, then open them…you will find yourself, in Neverland! 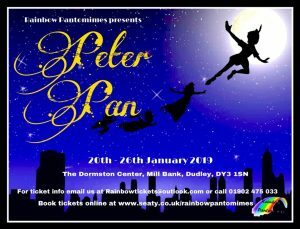 Welcome to Rainbow Pantomimes 27th Annual show! Come with us into the mystical and magical world of NEVERLAND! Who knows what fun (or strange) characters you may meet! 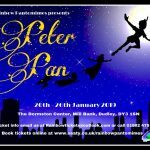 Come and join Peter, his friends, a naughty fairy and the evil HOOK in a hilarious show, full of song and dance for all ages to enjoy! So come along, join in the fun and don’t forget your fairy dust, for you never know, where our journey may take us!